In the second part of his journey round the Heart of Scotland, Cameron McNeish celebrates what he says is Scotland's 'world class landscape'. 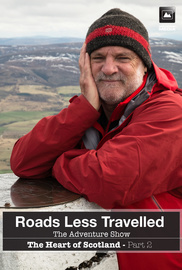 In the second part of his journey round the Heart of Scotland, Cameron McNeish celebrates what he says is Scotland's 'world class landscape'. From the Falls of Bruar, he heads south east to the magnificent Angus Glens before turning north to Deeside. Finally, to complete a wonderful circle he tramps across the wild Cromdale Hills. Travelling on foot, by bike and taking to the air, he joins a descendent of the travelling folk, a collector of traditional songs and has first hand experience of how illicit whisky stills once worked. And during his 300-mile journey, he meets two people whose lives have been changed by the outdoors.